Thank you Joan! Wonderful, comprehensive list. It's much appreciated. Thank you so much for this Joan! I agree! Thanks a lot for this very thorough list. Thanks so much Joan. This is such a strong varied list. JUST read about your list in ARTBUSINESSNEWS.COM, March/April 2012 Congratulations on the recognition and THANK YOU for your work! What an interesting list that surely helps many people!. I´m 100% impressed. pd: I´m an artist from Barcelona (Spain) and have never found in Spain, a blog with the resources you provide. The information and resources within these pages are priceless. Thank you so much! thank you so much for the licensing information! Thanks! One my way :) I just heard back from my first submission! Thank you for the useful and relevant information in your blogs. I am new to the world of licensing so I am going to be going back through the archives to learn as much as I can. Do you have dealings with art licensing agents in Australia? I'm glad that my posts are useful Daniela. No, I do not have any contacts with agents outside of US. You may be able to find art licensing agencies in Australia by searching the Internet. Good luck! thank you so much for taking your time to create this list. Thank you very much for sharing all this info to us. Much appreciated. Happy holidays Joan! This information was really helpful, thank you for sharing! This information is priceless. What a kind hearted, caring, confident individual you are. Many people fear sharing information. And then there are people like you who share it all. I love your spirit. 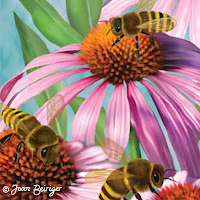 Joan I want to submit my art to an agent is 300 resolution sufficient to submit my work. I am at a loss for how to change the resolution without damaging my artwork. Help. Thanks for all of your information. Are you aware of any reps for adult coloring books? No I do not know of any reps that will rep artists that only have art for the adult coloring book industry. Most reps or otherwise known as agents in the art licensing industry usually does not represent artists that have art that appeals to only one type of manufacturer. There is not enough revenue that can be earned that way and especially for the adult coloring book industry that is over saturated with books and difficult to find manufacturers willing to license this type of art. Agents are looking for artists who has created art that appeals to many industries - paper products, table tops, decorative flags, etc. Thank you so much for sharing this info. You are the best. Thank you Joan for this list.